Refunds: Tickets purchased online through Etix will be refunded automatically. Tickets purchased in person at First Avenue, the Turf Club, the Depot Tavern, or through our local ticket outlets can be refunded at The Depot or the Turf Club. The Depot Tavern is now open. 7th St Entry re-opens Saturday, August 15 for Great Peacock, as scheduled. 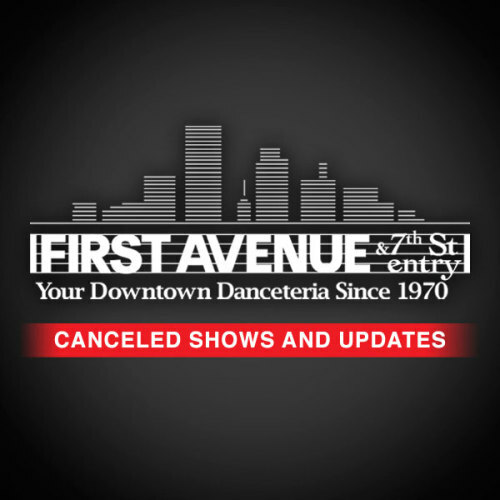 First Avenue, 7th St Entry, Record Room, and The Depot Tavern will be closed Thursday, August 13 and Friday, August 14. All scheduled shows on those days have been canceled, and our standard refund policy applies. Tickets purchased online through Etix will be refunded automatically. Tickets purchased in person at First Avenue, the Turf Club, the Depot Tavern, or through our local ticket outlets can be refunded at the Depot or the Turf Club starting Saturday, August 15. We will continue to update our website and social media as more information about upcoming shows is confirmed. Thank you to the Twin Cities community for the support!